Basil. It’s what dreams are made of! We’re growing thousands of potted basil plants and delivering hundreds each week! We grow and supply a dozen varieties of Potted Herbs on a weekly basis this time of year to retailers around the area. Where can you get our Potted Herbs?! We’re so glad you asked! Every week we deliver to @graintraincoop in Petoskey & Boyne City, @olesonsfoodstores in Petoskey, @oryanatc in Traverse City, and @burrittsfreshmarkettc in Traverse City! Plus, you can always get them from us directly at the Petoskey and Boyne City Farmers Markets! We love sharing our Potted Herbs with you so you can grow incredible summertime flavors in your kitchen while Mother Nature keeps doing her spring thang. Fresh herbs are one of our most favoritest things we grow on our farm - all you have to do is pluck a few leaves, sprinkle on your meal, and enjoy the rich flavor and aromas! Harbor Springs Michigan shared a photo. Below are the latest postings from the HotDoggers Coney Cafe Page On Facebook. If you aren’t quite ready to put your race skis away but you have thought about dusting off the clubs, then we have the event for you. The Hemlock Open is a two person team competition. 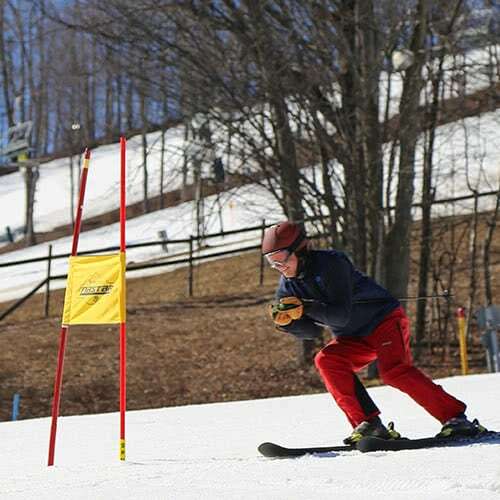 It consists of two runs of slalom in a dual format on North Boyne in the morning. In the afternoon, enjoy a two person, 9 hole scramble. Each team member’s best run is added together with their team golf score to determine the total team score. There will be prizes from Rossignol and Under Armour for top finishing teams and special event winners. Date is subject to change dependent on slope and golf course conditions. Minimum age of 15 years old (or freshman in high school) to participate. Space is limited, and this event does sell out. Register early to ensure a spot! This event is SOLD OUT, but you can still submit a registration form to be added to the wait list. The Petoskey Regional Chamber of Commerce invites you to mark your calendar for the 16th Annual Festival on the Bay, August 16-18, 2018 at the Petoskey, Michigan waterfront. Every year, visitors enjoy great music inside the Entertainment Tent and a fun Children’s Area all weekend. Other activities include, a Cardboard Boat Race, Waganakasing Bay Day, The BIG Art Show, a Petting Zoo and so much more! Below are the latest postings from the Festival On The Bay Page On Facebook. Petoskey Festival on the Bay shared a post. 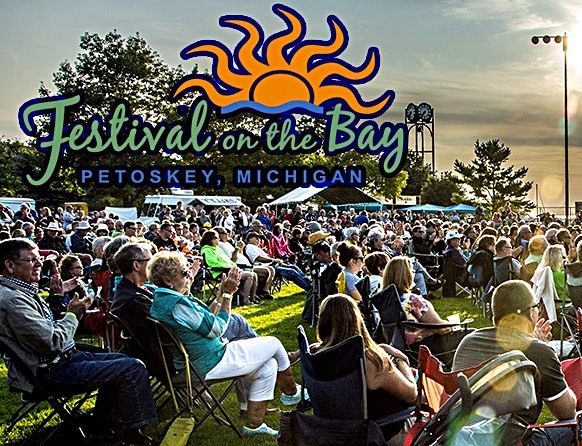 Petoskey Festival on the Bay updated their cover photo. Tag your Festival On The Bay instagram photos with #FestivalOnTheBay and they will appear here in our Festival On The Bay Instagram Photo Stream. Top professionals and amateurs from around the state will gather at Boyne Highlands Resort for this 18 hole qualifier in an attempt to qualify for the Michigan Open Championship to be played at Prestwick Village Golf Club June 8-11. This qualifier will be played on the Moor Course. 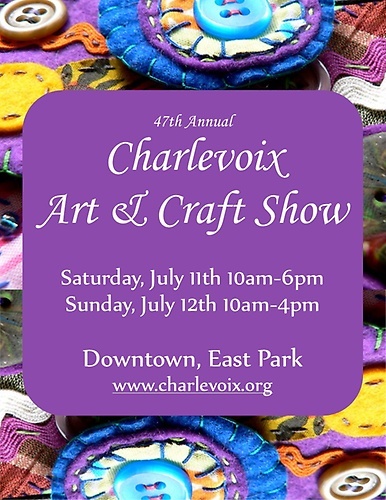 Combine one of the most picturesque settings in the state with a gathering of 150 artists and craftsmen from around the country, and the result is Charlevoix’s 47th Annual Art & Craft Show. This popular event will take place downtown Charlevoix in East Park on July 11 & 12, 2015. This year’s show has something for everyone, offering an exciting mix of fine arts and hobby crafts. Acrylic and oil paintings, sculpture, hand blown glass beadwork, pottery, baskets, furniture, clothing, hand woven rugs and quilted works are just a few of the things you will find. It is a spectacular representation of craftsmanship and artwork with many fun and unique products to choose from. If you are looking for a unique shopping opportunity in a one of a kind community, Charlevoix the Beautiful is the place to be this summer on July 11 & 12. Show hours are Saturday 10:00am to 6:00pm and Sunday 10:00am to 4:00pm. We are officially OPEN for the season! Our outstanding snowmaking crew fired up 155 BOYNE Low-E fan guns Thursday afternoon and ran them for over 60 hours! Couple that with the 4″ of snow that Mother Nature has dropped on us over the weekend, and things are looking great! We are currently planning on running the Mountain Express, Hemlock, Victor, and Boyneland lifts allowing access to Hemlock, Pierson, Victor, Deer run, and Boyneland. Come and make your mark on our coorduroy! Don’t forget about Avalanche Bay Indoor Waterpark! With 88,000 square feet of wet and wild fun for all ages, the park stays at a toasty 84 degrees year-round! Book now and save 25% before December 25! your trip and schedule a Zipline Adventure Tour to see the resort from a whole different angle! We have tons of great ways to have fun here at Boyne Mountain Resort! Curious about how we have changed? Read up right here! Go straight to the lifts on your first day to the resort by picking up your 2015/16 season pass in advance. If you don’t want to go for a season pass, but plan to come ride several times, grab a Frequent Skier Rider Card and save up to $25 on your lift tickets this winter! Boyne Mountain Resort is with Nick Snider and 4 others. UPDATE: The slopes will open on Sunday from noon-4:30pm, and we will announce available terrain on Saturday afternoon. Lift tickets for Sunday are $25 for most ages, and pricing for Monday and beyond is to be determined. 6-for-1 Update: Due to limited terrain, we've made the difficult decision to forego the event this season. Thank You Boyne for making the difficult business decision to stay closed a bit longer to build your base and ultimately improve the safety of the hill and your potential to stay open during the busy holiday time. What a tough spot to be in. Thanks for doing your best! Good call. Pile it up. Your website still shows the 6 for 1 is a go. I assume your facebook page has the correct info? Disappointed about the 6-1. I had taken the day off to bring the kids. Why aren't the lifts opening earlier than noon? Football starts at 1! Why aren't you open tomorrow? You should pick another date in the new year. We look forward to this event each year. It would be a shame to cancel it completely. We are officially open for the season! On top of providing us with snowmaking temperatures this past weekend, Mother Nature added 5″ of her own to the mix, making for a great start to our new base. We are planning on adding some temporary terrain park features at the top of Heather for you to work on your bag of tricks! We will spin the Heather Express and the Wonder Carpet from 9am-4:30pm today (MONDAY, Dec 21)! Ticket prices have changed, visit our website for a breakdown. Heather, Olympic, K2, North Challenger and the North Camelot beginner areas will all be open today. Come out and create some new memories on our slopes! Looking for a different way to enjoy Boyne Highlands Resort? Step into the Adventure Center and sign up for a Zipline Adventure Tour or a Horseback Trail Ride. Or slip into serenity at The Spa at Boyne Highlands. Read about all of the changes you can expect coming into this winter at Boyne Highlands Resort! Pick up your 2015/16 season pass before your first day on snow so that you can go straight to the lifts and maximize your riding time! We had a great day today. Here are a few highlights! We'll see you again tomorrow from 9am-4:30pm.